These short ribs are SO tender and juicy! They fall right off the bone and are packed with aromatic flavors of fresh veggies, dried herbs and dark beer. They’re the perfect, make ahead, family dinner for those chilly Wisconsin nights! Can I use a different cut of meat instead of short ribs? Yes! Sometimes I can’t find short ribs and I’ll substitute a beef chuck roast instead. 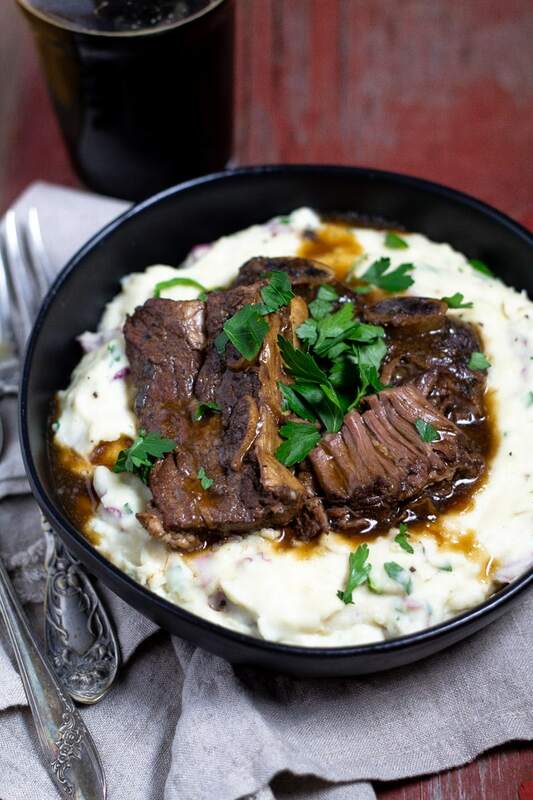 In fact, I have a bourbon braised beef recipe where I used a chuck roast (cut into short rib size pieces) and it is definitely one of the fan favorites here at Midwest Foodie! This is a good recipe to use a less expensive cut of meat as braising it in the slow cooker will make the meat super tender and juicy. If you’re curious what other cuts of meat might work in this recipe, this article gives great information about the primal cuts of beef and what they’re best used for. 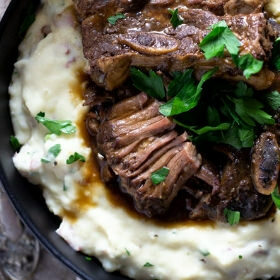 Can I make braised short ribs ahead of time? Another yes! These braised short ribs actually just seem to get better with time. As with most slow cooker recipes, the active prep time for this recipe is really minimal, so these ribs can do their business while you’re at work or running errands. Then you walk in the door to a home cooked meal that’s ready to eat. However, if for some reason you find yourself wanting to prepare these a day or two ahead of time, that’s no problem either! I would follow the recipe below, allow the ribs and braising liquid to cool for about an hour after they’ve finished cooking and toss them in the fridge. When you’re ready to eat, transfer ribs and braising liquid to a large pot on the stove, cover and heat over low or medium low heat until they are heated through. What kind of beer should I use? I suggest a dark beer. A porter is my personal favorite for this recipe but a stout or even a lager or ale would work great. Try to find a full bodied beer as it will give you more flavor in the dish. Whatever you choose, please don’t use Bud Light or Coors or the like. This is a good opportunity for you to try a local made beer or something you maybe haven’t had before. Be adventurous, be daring – try new beer! My motto is: If you don’t like beer, you haven’t had the right beer (and let’s be honest, most people’s experience with beer is Bud Light or Coors…). And as long as we’re going there: If you don’t like IPAs you haven’t tried the right IPA (try Gunpowder IPA from The Brewing Projekt and tell me you don’t like IPAs?!?!?!). Microbreweries are everywhere now and they typically offer a very wide variety of beers. So head down to your local brewery, tell the bartender what you think you’d enjoy (light vs. dark, fruity vs. hoppy, sour vs. sweet) and let them help you choose some beers to try. Most places will offer a flight so you can sample without commitment. Personally, I’m more of a wine girl myself, but I LOOOOOOVVEEE sour beers. Like, really love. And I never would have known if I hadn’t tried! What should I serve with my short ribs? Well, clearly my serving suggestion is my garlic mashed potatoes (which are also delicious when made with baby reds as I’ve done here in this meal). 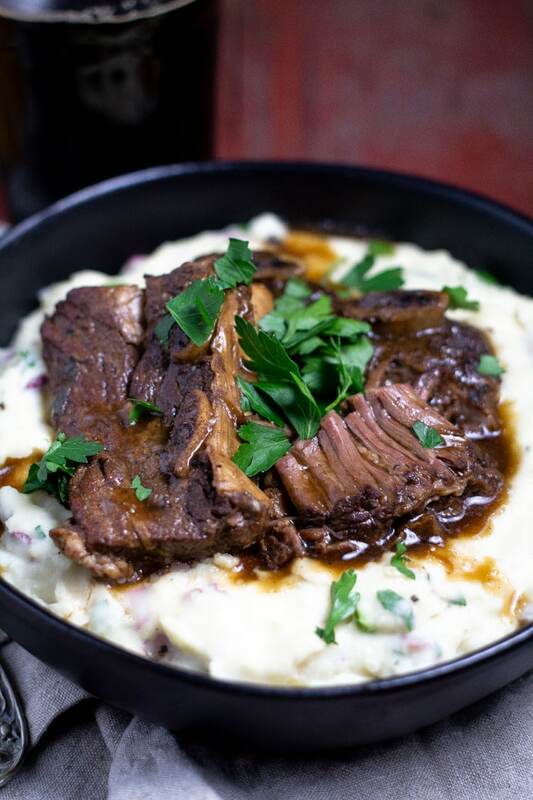 But the tender beef also goes great with mac and cheese, polenta, or even grits! You might wonder why I didn’t serve the beef alongside the aromatic veggies they cooked in the crock pot with? Each time I’ve made this I found that the veggies really gave all of their delicious flavor to the beef and the flavor and texture that was left just wasn’t enjoyable for me. Plus the tender, fall apart beef really pairs well with something rich and creamy!! Use a good quality beer. Bud Light should not be used in this recipe. Honestly Bud Light should never be used in any recipe! Find a good quality beer that you like the taste of. You can sub beef chuck roast for short ribs. If you can’t find beef short ribs, feel free to substitute beef chuck roast instead. If I have the time, I will cut the roast into short rib sized pieces for easy portion control and serving. Don’t skip the sear! Searing the beef short ribs is going to add a very important layer of flavor. It might seem like an annoying extra step, but it’s well worth the extra time and effort! These short ribs are tender, juicy and fall right off the bone! They’re the perfect easy weeknight meal for your busy family. Heat 1 tablespoon olive oil in a large saute pan over medium-high heat. Sear short ribs in batches, cooking them for 1-2 minutes on each side until a dark golden brown crust forms. Add remaining tablespoon olive oil before cooking the next batch. Transfer seared ribs to the slow cooker insert. Add onion, garlic, beef broth, beer, celery, carrots, bay leaves, parsley, thyme, sage and a moderate amount of salt and pepper. Cover and cook on low for 8 hours or until the beef falls off the bone and shreds easily. Strain braising liquid and add all but two cups back to the slow cooker. Transfer two cups of the braising liquid to a small saucepan over medium-high heat. Combine cornstarch with 2 tablespoons cold water, add that to the braising liquid and stir to combine. Simmer braising liquid over medium to medium-low heat for about 20 minutes or until it thickens and reduces by about half. This is a great time to make those mashed potatoes, grits, or mac and cheese. Transfer beef to a serving dish and pour gravy on top. Garnish with fresh chopped parsley and enjoy! I just made this for tonight dinner – yum!! I have zero complaints and will be making this again soon. Yes!! Love to hear that. Thanks for the comment Julia!!! 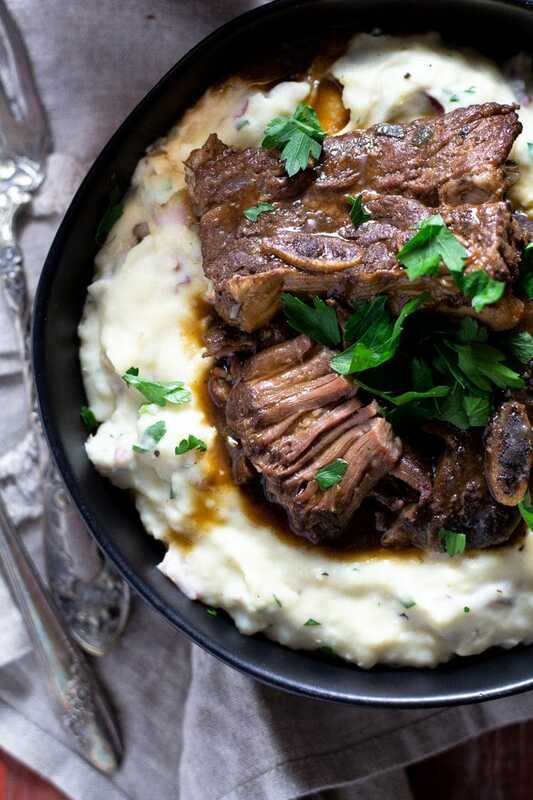 Possibly my family’s favorite slow cooker short rib recipe! 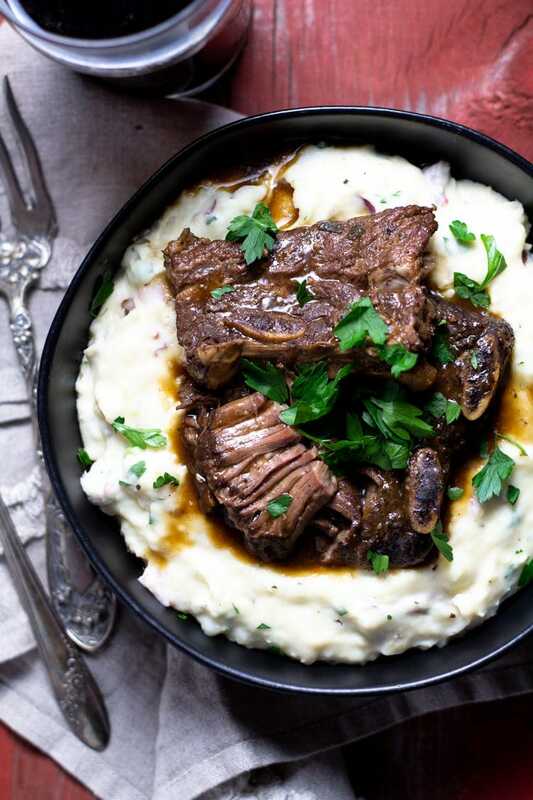 I love short ribs and these look so amazing! Love that they are a slow cooker meal too. Yum! 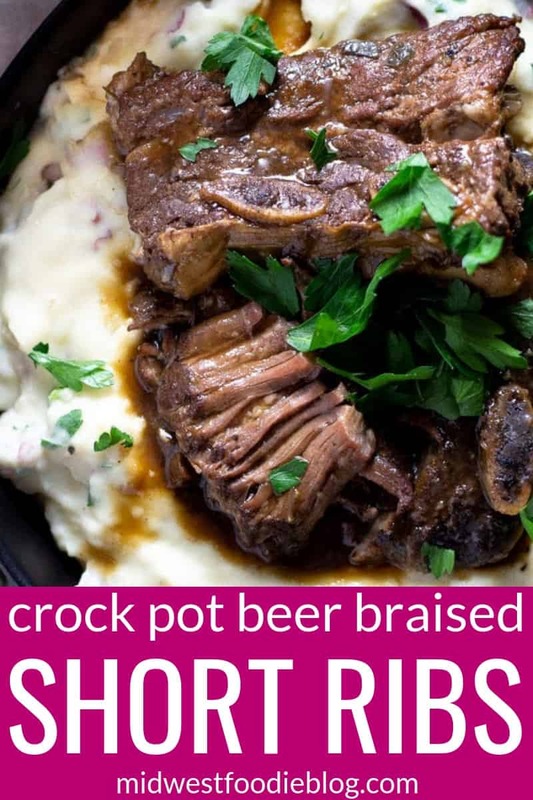 I love the idea of braising the short ribs in beer. I bet the flavor is amazing! Can’t wait to try it out. I LOVE beer braises. SO MUCH FLAVOR! This is my kind of comfort food. Definitely one to try at the weekend. I could totally use this on this cold, snowy day! I am wishing I had a big bowl myself! So tender and so delicious, I will never say no to this recipe!! My mother has that silver pattern!! She calls it Nasturtium. Anyway, the short ribs look amazing! I have to cook some for a burger challenge. I’ll be putting this recipe to use. Can I make it on high for 6 hours instead of 8 hours? Definitely! You could probably even get away with 4-5 hours on High. Once they are fall apart tender, they are done! Can I make this in the oven? Yes! Just follow the same instructions in the recipe but braise them in a Dutch oven in the oven. I’d guess around 350 degrees would be the sweet spot. And it will likely take 3-4 hours. You’ll know they’re finished when the ribs are falling off the bone! Would love to hear how you like the recipe once you’ve made it! 3 ribs for 10 people? I did 4 tablespoons of cornstarch to two tablespoons of water and it was very thick and chunky. Is that correct? It would not mix into the braising liquid. Oh no! Did you use warm water instead of cold perhaps? That’s one of my tried and true recipes and I’ve never had an issue with the corn starch 🙁 DANG. Hope it still turned out okay! Hi. Just getting into cooking. Crazy at 69 I know, but it’s out of necessity. So my question about this braised short rib, why not saute the onions and garlic as well. Jim – It’s never too late to learn to love cooking!! You could definitely saute the onions and garlic too! In the interest of saving time and making my life a little easier, I didn’t in this recipe but you are more than welcome too! It would certainly add another layer of flavor 🙂 Happy Cooking!